Our range of Heat Exchanger is extensively used to transfer heat energy from one medium (fluid, liquid and gas) to another medium (fluid, liquid and gas) without mixing them. 1-Stainless Steel Grade 304/316 Carbon steel. 2- Having 1mm thk. Tube. 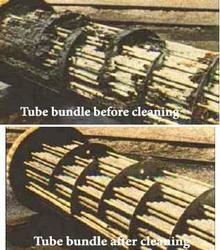 We are providing Heat Exchanger Tubes Cleaning By Hydro Jet in Bharuch, Gujarat, India. Hydro Jet is the machine used for moving heat from one fluid to other. Here a solid wall divides the fluids, therefore they cannot mix again.This Heat Exchanger is built from quality steel with sustaining mouth for higher thermal efficiency and safety in situation of heavy vibration. 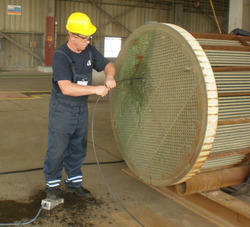 We have special nozzle for pipe internal jet cleaning, heat exchanger tube internal jet cleaning.